Prior to gait initiation (GI), anticipatory postural adjustments (GI-APA) are activated in order to reorganize posture, favorably for gait. In healthy subjects, the center of pressure (CoP) is displaced backward during GI-APA, bilaterally by reducing soleus activities and activating the tibialis anterior (TA) muscles, and laterally in the direction of the leading leg, by activating hip abductors. In post-stroke hemiparetic patients, TA, soleus and hip abductor activities are impaired on the paretic side. Reduction in non-affected triceps surae activity can also be observed. These may result in a decreased ability to execute GI-APA and to generate propulsion forces during step execution. 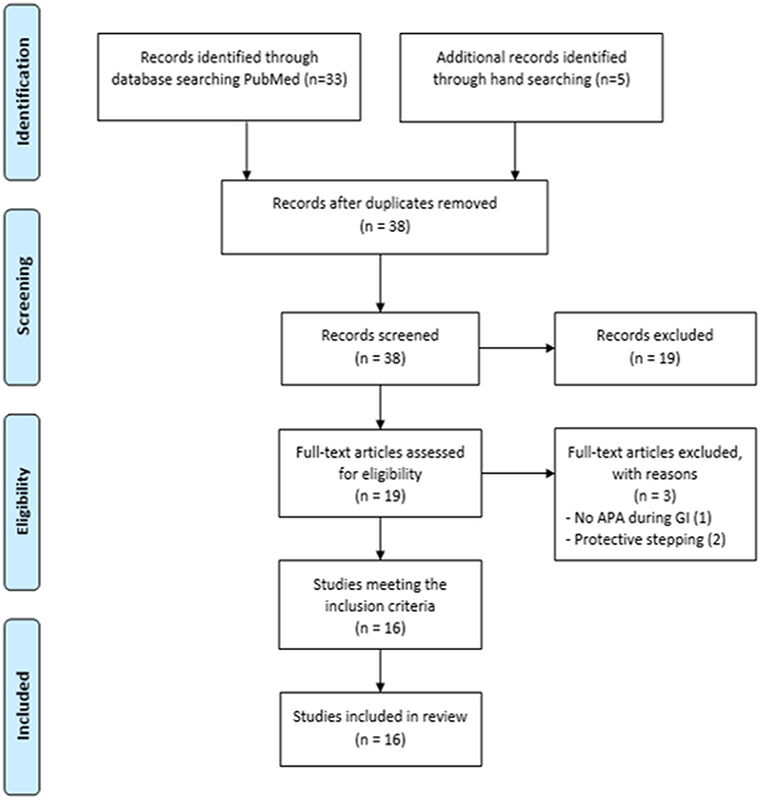 A systematic review was conducted to provide an overview of the reorganization which occurs in GI-APA following stroke as well as of the most effective strategies for tailoring gait-rehabilitation to these patients. Sixteen articles were included, providing gait data from a total of 220 patients. Stroke patients show a decrease in the TA activity associated with difficulties in silencing soleus muscle activity of the paretic leg, a decreased CoP shift, lower propulsive anterior forces and a longer preparatory phase. Regarding possible gait-rehabilitation strategies, the selected studies show that initiating gait with the paretic leg provides poor balance. The use of the non-paretic as the leading leg can be a useful exercise to stimulate the paretic postural muscles. Gait initiation (GI) is a functional task classically used in the literature to investigate balance control mechanisms in healthy and pathological individuals (1, 2). GI may be a challenging task for balance control in stroke patients because of their sensory and motor impairments (3–5). Better knowledge of the altered balance control mechanisms in these patients is important to allow clinicians to target rehabilitation programs directed at minimizing the risk of falling. However, to date there is no review involving the changes in balance control mechanisms during GI in stroke patients. GI is composed of a postural phase (i.e., “anticipatory postural adjustments,” APA) where the dynamic phenomena necessary for a stable whole-body progression are generated, followed by the foot lift phase that ends at the time of swing toe clearance (i.e., body mass is transferred to the stance leg during this phase), and an execution phase that ends at the time of foot contact (2) (see Figures 1A,B). Figure 1. (A) Example of biomechanical traces obtained for one representative normal subject initiating gait at a spontaneous velocity (one trial). Anteroposterior direction x”G: anteroposterior center of mass velocity; z”G: vertical center of mass velocity; peak vGRF: the maximal moment of vertical Ground Reaction Force; xP, Center of pressure (COP) displacement; xPmax: maximal backward shift of CoP. Mediolateral direction yP, mediolateral COP displacement; yPmax, maximal mediolateral shift of COP. Vertical lines, t0 onset variation of biomechanical traces; FO, Swing foot off; FC, Swing foot contact. FL, Foot lift. Horizontal dashed line: dGI-APA, duration of Gait Initiation-Anticipatory Postural Adjustments; d-EXE, duration of execution phase. SOL-SW, Soleus electromyographical activity of swing leg; SOL-ST, Soleus electromyographical activity of stance leg; TA-ST, Tibialis Anterior electromyographical activity of stance leg; TA-SW, Tibialis Anterior electromyographical activity of swing leg. (B) Stick representation of the different phases and temporal events of gait initiation in a normal subject. QS, quiet standing; GI-APA, gait initiation-anticipatory postural adjustments; EXE, execution phase. Current literature describes gait initiation APA (GI-APA) components in the sagittal and frontal planes. In the sagittal plane, GI-APA are characterized by a backward center of pressure (CoP) shift with respect to the center of mass (CoM) position, providing the initial propulsive forces to progress forward (6, 7). This CoP shift is caused mainly by a bilateral reduction in soleus tonic activity and an increase in tibialis anterior (TA) tonic activity (8). In the frontal plane, the CoP is displaced toward the leading leg during GI-APA, which serves to move the CoM in the contralateral direction. This CoM shift helps disengage the leading leg for step execution and is crucial for maintaining stability (9). This mediolateral CoP shift is thought to be caused by leading leg abduction, accompanied by trailing leg ankle dorsiflexion and knee flexion (10). In post-stroke hemiparetic patients, damage to central structures results in a reorganization of GI-APA. The goal of this systematic review was to provide an overview of the characteristics of GI-APA in this population. The Preferred Reporting Items for Systematic Reviews and Meta-Analyses (PRISMA) methodology was employed for this systematic review. A bibliographical search was conducted in PubMed and Google Scholar using the following keywords: (“gait initiation” OR “step initiation”) AND (“stroke” OR “hemiparesis” OR “hemiplegia”). Only articles available in English or French and published before 31 August 2018 were selected. Additionally, manual searches were conducted from the reference list of each article found in the database until no further citations could be identified. To be included, the studies had to meet all of the following inclusion criteria: (1) anticipatory postural adjustments were explored during the paradigm of gait initiation with a force platform or electromyographical (EMG) activity (6, 8); for review see (2), (2) at least one stroke patent group was studied, (3) all types of studies (i.e., randomized and non-randomized control trials), (4) only articles in English or French, and (5) articles published in peer-reviewed journals. GI-APA were retained as a main inclusion criteria because it plays a major role in postural stability and GI performance [for review see (2)], notably for stroke patients which are able to develop different motor strategies regarding the leg which initiates the gait [i.e., paretic or non-paretic leg; (3–5, 11, 12)]. On the contrary, studies were excluded if they observed gait without the study of anticipatory postural adjustments or if no stroke patients were included in the protocol. Study selection was conducted in three steps (13, 14). First, two reviewers independently applied the inclusion and exclusion criteria to all the citations. Then, abstracts were screened to identify the titles representing a “best fit” with the aim of the present study. Finally, the reviewers read the full articles to reach a final decision on whether they should be included in the systematic review. When the relevance of a study was unclear from the abstract, the full article was read, and disagreements were resolved through group discussions with a third expert until a mutual consensus was reached. The reviewers met at the beginning, midpoint and final stages of the review process to discuss challenges and uncertainties related to study selection, and to go back and refine the search strategy if needed (Figure 2). Figure 2. Study selection procedures and results reported in a flow-chart, as suggested by Moher et al. (15) and according to CONSORT statement. The Downs and Black scale was used to assess the risk of bias and the methodological quality in the selected studies. The scale was used for its ability to provide an overview of the study quality of not only randomized controlled trials but also non-randomized studies (16). Additionally, this tool has been demonstrated to have a significant correlation with the valid PEDro scale (17, 18). The Downs and Black scale are divided into 27 questions and the answer to each can be “yes” (one point), “no” or “unable to determine” (zero point). Only the last item was modified from the original scale, as described previously by Trac et al. (16). The maximum score is 28: one point for each question, except for question five (two points). After all of the articles were assessed and total quality scores were calculated, the level of evidence appraisal was conducted using Grades of Recommendation, Assessment, Development, and Evaluation-Confidence (GRADE) as recommended by The Cochrane Qualitative and Implementation Methods Group (19). The GRADE system classifies the quality of evidence in one of four levels: high, moderate, low, and very low. Evidence based on RCT begins as “high-quality,” whereas observational studies start with a “low quality” rating. Grading upwards may be warranted if the magnitude of the treatment effect is very large, if there is evidence of a dose-response relation or if all plausible biases would decrease the magnitude of an apparent treatment effect (20). Table 1. Clinical characteristics of the population in the selected studies. Thirty-three articles emerged from the PubMed search. Five additional articles were identified through manual searching, for a total of 38 articles, 16 of which met the inclusion criteria (3–5, 11, 12, 21–23, 25–31). A total of 220 patients were included (Table 2). Table 2. Methods and main results of the selected studies. The patients’ age ranged between 21 and 86 years. In 11 of the 15 selected articles, GI was compared in healthy adults vs. stroke patients (5, 11, 21–24, 27–31). In the five remaining articles, only stroke patients were included (3, 4, 22, 25, 26). In 11 articles, participants had experienced stroke at least six months prior to GI recording (4, 5, 21, 23–26, 28–31). In one study, patients had experienced stroke 3.7 months prior to GI recording (11). In the remaining four studies, the post-stroke interval was not indicated (3, 12, 22, 27). The symptoms always consisted in hemiparesis, although its degree was rarely specified (4, 5, 25, 27–29). The presence and degree of spasticity was acknowledged only in Bensoussan et al. (4). In four articles, participants were asked to perform a single step in a reaction-time paradigm, i.e., after the deliverance of a GO signal (25, 27–29). In the other articles, participants initiated gait spontaneously and continued walking at their own speed. In two articles (21, 23), the contralesional leg was systematically used as the leading leg. In the other articles, both legs were used as the leading leg. Dynamic investigation using force platforms was conducted in all articles except one (26). EMG investigation was also conducted in five articles (3, 23, 26, 27, 31). The results of the quality assessments for each study are given in Table 3. Only non-randomized studies corresponded to the inclusion criteria and were evaluated. According to the modified Downs and Black scale, the mean quality index score for the studies was 14 ± 1.6, with scores ranging from 11 (3) to 17 (26, 29). Only non-randomized observational studies corresponded to the inclusion criteria and were evaluated, so the level of evidence was classified as “low quality.” No treatment was administered in the studies and no meta-analysis was conducted, so no grading upwards could be done. Table 3. Quality assessment analysis according to the modified Downs and Black scale. Rajachandrakumar et al. (12) showed that when participants with sub-acute stroke initiated gait at their own speed, 78% exhibited at least one trial with a GI pattern classified as “atypical.” Atypical GI trial corresponded to a trial performed without APA or with “multiple” APA (i.e., with a multi-peaked CoP trace). In contrast, Martinez et al. (25) observed GI-APA in all trials that involved voluntary stepping in post-stroke patients (mean chronicity: 2.9 years), while APA were absent in 25% of trials involving perturbation-induced stepping. Rajachandrakumar et al. (12) showed that trials with multiple APA had a longer APA duration than normal GI trials (i.e., GI with a single peak CoP trace). A longer APA duration in stroke subjects compared to healthy subjects was reported by many authors (11, 23, 25, 27, 28). In addition, Gama et al. (21) recently established that stroke patients presented lower velocity of the CoP in both the ML and AP directions during the anticipatory phase of gait initiation. Sousa et al. (24) showed that post-stroke patients presented only half of the COP displacements (both in the frontal and sagittal plane) compared to healthy subjects. Gama et al. (21) demonstrated shorter ML and AP CoP displacements as well. A smaller COP backward shift was also demonstrated by Hesse et al. (11). Melzer et al. (28) and Sharma et al. (22) showed that anteroposterior ground reaction forces generated by both the paretic and non-paretic leg in post-stroke patients during APA were lower compared to healthy controls. Altogether, these studies indicate that stroke patients present impaired APA compared to healthy subjects, characterized by atypical patterns, longer duration and lower amplitude. The results reported in the paragraph below show that GI parameters can also differ depending on which leg (i.e., paretic or non-paretic) is used as the leading leg. Impairments of muscle activation during APA were demonstrated by many authors in stroke patients compared to healthy subjects (3, 23, 26, 31). Sousa et al. (24) showed that when the paretic leg was used as the leading leg, the TA of the paretic leg presented only half of the EMG activity observed in healthy subjects. On the other hand, Ko et al. (26) showed that when gait was initiated with the non-paretic leg, the TA activation in the paretic leg was increased by 27 to 36% compared with the paretic leg as leading leg. 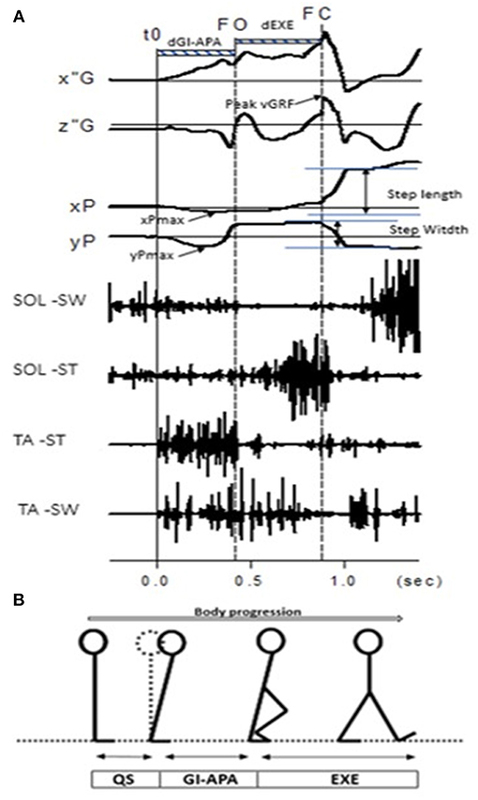 Moreover, stroke patients exhibited a bilateral decrease in TA activity during GI-APA and had difficulties in reducing tonic activity in the soleus muscle of the paretic leg (3). Finally, Kirker et al. (31) showed that when stroke patients initiated gait with the paretic leg, GI-APA were characterized by an impaired activation of the gluteus medius muscle of the paretic leg, which was compensated by more prominent activity in the contralateral adductor. Rajachandrakumar et al. ( 12) showed that the frequency of trials with no APA did not differ when gait was initiated with the paretic or non-paretic leg. In contrast, multiple APA were more prevalent when the non-paretic leg was used as the leading leg. Additionally, when stepping with the non-paretic leg, the frequency of trials with no APA was negatively correlated with motor recovery. Bensoussan et al. (5) showed that the postural phase was longer when the paretic leg was the trailing leg. In contrast, Hesse et al. (11) and Melzer et al. (28) found no significant difference of postural phase duration when initiating gait with the paretic or non-paretic leg. Sharma et al. ( 22) showed that patients with left hemisphere lesions generated greater lateral ground reaction forces with the non-paretic left leg than with the paretic right leg. In contrast, medial ground reaction forces were equivalent for both the paretic and non-paretic leg. Additionally, Hesse et al. (11) reported that the amplitude of the mediolateral CoP shift during APA was lower when gait was initiated with the paretic leg. In contrast, the CoM did not move toward the trailing leg when patients started with their non-paretic leg, while the trajectory of the CoM was similar to that of healthy subjects when patients initiated gait with the paretic leg. Regarding APA in the sagittal plane, the same authors found that anticipatory anterior-posterior CoM acceleration during APA was lower when starting with the paretic leg (22). Tokuno and Eng (30) found that the anteroposterior impulse generated by the trailing leg was less than half that of healthy subjects. Additionally, Bensoussan et al. (4, 5) found that the ground reaction forces exerted by the paretic leg were directed backwards during APA (retropulsive action) but were directed forward for the non-paretic leg (propulsive action). Altogether, these findings indicate that the use of the paretic leg as the leading leg is associated with difficulties activating the TA and gluteus medius muscles during APA, which result in reduced CoP shift and CoM acceleration. In contrast, the use of the paretic leg as the trailing leg seems to challenge balance to a greater extent during GI. The aim of this systematic review was to provide an overview of the impact of stroke on the organization of APA associated with gait initiation (GI-APA). Altogether, the reviewed studies suggest that the anticipatory phase of GI is impaired in stroke patients. The findings principally highlight the changes in the pattern and spatiotemporal parameters of GI-APA in comparison with healthy subjects and the differences in initiating gait with the paretic or non-paretic leg. Moreover, this review may provide an evidenced-based theoretical framework for clinicians involved in rehabilitation programs for stroke patients. The majority of the included studies were scored ≥ 14/28 according to the modified Downs and Black scale. 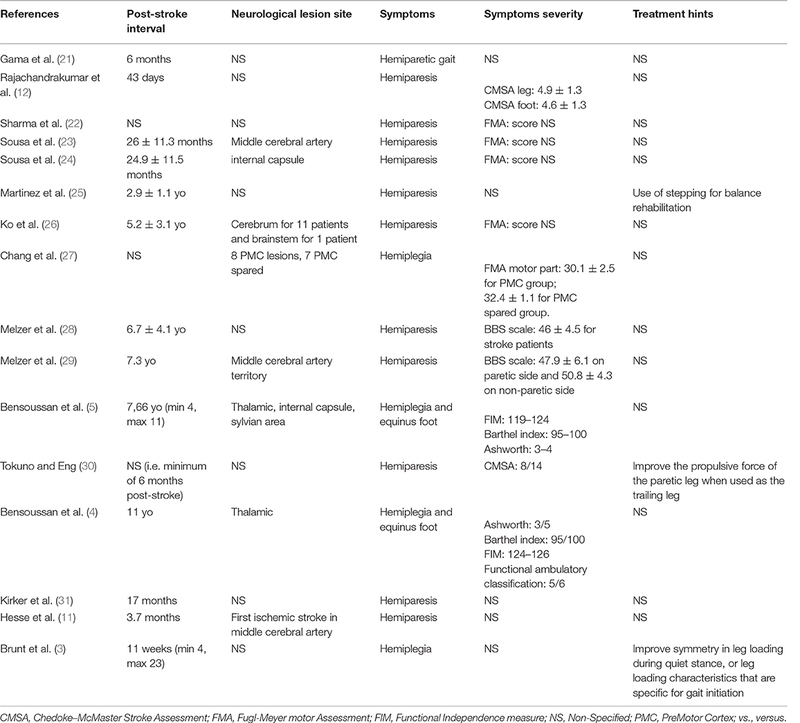 The most common deficiencies in these included studies, in reference to the modified Downs and Black scale, were the lists of the principal confounders (question 5, i.e., not applicable for this review, only for interventional studies) and the adverse effects (question 8, i.e., not applicable for this review, only for interventional studies), the interventions not representative of usual care (question 13, i.e., not applicable for this review, only for interventional studies), the blinding of the patients or the assessors (questions 14 and 15, i.e., not applicable for this review, only for interventional studies), the specification of the time period of recruitment (question 22), the randomization of the subjects in groups (questions 23 and 24, i.e., not applicable for this review, only for randomized control trial studies) and the investigation of the main confounders (question 25, i.e., not applicable for this review, only for interventional studies). These absences were not surprising because the studies did not include intervention and control groups to measure the effects of treatment, but were observational studies comparing GI between subjects during a single session. Because of the absence of randomized controlled trials, a low quality level of evidence for the results may be provided (20). This means that further research with randomized protocols and more standardized protocols is very likely to have an important impact on our confidence in the results. The level of the quality assessment, according to the modified Downs and Black scale, must be considered with caution because there is no treatment group (i.e., interventional randomized controlled trials) in the included studies. Martinez et al. (25) found that when stroke patients initiated gait, GI-APA were present in 100% of trials, whereas Rajachandrakumar et al. (12) reported the possibility of trials with no GI-APA. The subjects in these two studies were at different post-stroke times and the significant changes in motor recovery occurring in the weeks after stroke may partially explain the observed differences (32, 33). Rajachandrakumar et al. (12) found that trials with no GI-APA were more prevalent among patients who walked slowly, and that motor impairment was correlated with the frequency of trials with no GI-APA. Multiple GI-APA, the other atypical pattern described by the authors, was observed at a higher frequency when gait was initiated with the healthy leg. The “psychological apprehension” loading of the paretic leg may partially explain longer GI-APA duration and may reflect the priority of the central nervous system to secure mediolateral stability before walking (4, 5, 12). A longer GI-APA duration can also be attributed to delays in soleus deactivation (23) and TA activation (27). These muscle impairments probably lead to difficulties in correctly timing the CoP and CoM shift during GI-APA compared to healthy subjects. Lower GI-APA amplitude observed in both the frontal and sagittal planes may result in lower stability and lower progression velocity, respectively, during GI (11, 21–23, 28, 30). However, the hypothesis that the lower gait progression velocity observed in stroke patients results from GI-APA impairments requires further investigation (23). Indeed, it has been shown that the amplitude of COP displacement is similar between healthy and post-stroke participants when healthy participants are instructed to walk at a speed similar to that chosen by the post-stroke subjects (30). Thus, the lower GI-APA amplitude reported in stroke patients under spontaneous velocity conditions appears to result from their lower self-adopted speed compared to healthy participants. Furthermore, balance and performance during the execution phase is affected by the choice of the leading leg during the postural phase. GI-APA are dynamic phenomena that could impact balance (34–36) and an inability to support body weight during GI due to weakness in the paretic leg. Thus, lower GI-APA amplitude in stroke patients could result from postural muscle weakness or reflect adaptations to the lower balance state. Many studies included in the present review confirm the findings of Pélissier et al. (37) who described a reduction in the duration of the swing phase, step length, walking velocity, and magnitude of the propulsion force during the execution phase when initiating gait with the healthy leg. These effects could be the result of decreased plantar flexor, hip flexor and hip extensor strength on the paretic side (38, 39), which may underlie the inability to support body weight. The incapacity to correctly propel the CoM above the paretic leg during the stance phase may explain the higher degree of instability observed when starting with the non-paretic leg (3–5, 11, 22, 30, 31). Additionally, the paretic leg muscles contribute less to the load of the paretic side, generate less power, and may even produce retropulsive forces, which may reduce walking velocity, because all of the propulsive forces are generated by the healthy leg alone (4, 5, 40). Knowing the main characteristics of postural deficiencies during gait initiation or steady walking in stroke patients may help clinicians assess the efficiency of neurorehabilitation methods and provide an evidence-based theoretical framework for motor recovery. For example, the review of (37) established that the symmetry of stride was not correlated with walking performance (especially with the progression velocity). In addition, partial body support (i.e., on the non-paretic stance leg) was shown to have no effect on the anticipatory phase (21). These findings suggest that it is not necessary to obtain symmetrical static balance before starting gait rehabilitation. On the contrary, gait training should be started as early as possible after stroke. As documented in the literature reviewed above, initiating gait with the paretic leg improves stability and motor performance, so we recommend that rehabilitation programs promote this strategy in the early post-stroke period to improve patient mobility and autonomy. Gamma et al. (21) recommend the use of an over-ground body weight support to improve mediolateral APA (i.e., stability) without changing the anteroposterior APA velocity (i.e., performance). However, in practice the combination of different rehabilitation strategies, notably the use of functional electrical stimulation and brain-computer interfaces, seems to be more effective than over-ground gait training alone (41). Moreover, since using the paretic leg as the trailing leg has been found to increase the amplitude of TA muscle activity by between 27 and 36% (26), this strategy can be used as TA strength training to improve postural muscle performance in the paretic leg. Regarding possible gait-rehabilitation strategies, increasing TA muscle activity of the paretic leg during gait initiation seems to be an important target for motor rehabilitation, since bilateral TA activation during APA serves to provide initial propulsive forces that shift the whole-body forward (3). It is also involved in body balance maintenance during step execution (10). It is clear that strength training should not be restricted to the TA of the paretic limb but should involve all paretic leg muscles. Specifically, reinforcing hip abductor muscles may facilitate the anticipatory CoP and CoM shifts in the frontal plane (31), while reinforcing hip extensors, knee extensors and plantar flexors should facilitate body weight support against gravity and provide efficient propulsive forces in the sagittal plane (5, 22, 28, 30). In this way, the use of virtual reality training during gait initiation could help train and obtain recovery of force and power separately for each lower limb (i.e., paretic and non-paretic limb) in individuals with stroke (42). This systematic review provides an update on GI-APA reorganization following stroke. Stroke patients present atypical GI-APA patterns, longer GI-APA duration and lower GI-APA amplitude compared to healthy people, regardless of which leg is used as the leading or trailing leg. GI is facilitated when the non-paretic leg is used as the trailing leg because the weakness of the paretic leg leads to difficulties in supporting body weight during the upcoming stance phase. Further experiments should include distinct groups of patients in order to describe GI-APA features in acute, subacute and chronic stroke, and the influence of spasticity and of the lesion site. Understanding the changes in each population could be relevant for personalizing rehabilitation strategies. AD wrote the manuscript. TV and TH performed the bibliographical search and selected the articles to be included in the review. EY, J-LH, and SC reviewed the manuscript. 3. Brunt D, Vander Linden DW, Behrman AL. The Relation between limb loading and control parameters of gait initiation in persons with stroke. Arch Phys Med Rehabi. (1995) 76:627–34. 18. Aubut J-AL, Marshall S, Bayley M, Teasell RW. A comparison of the PEDro and Downs and Black quality assessment tools using the acquired brain injury intervention literature. NeuroRehabilitation. (2013) 32:95–102. doi: 10.3233/NRE-130826. 32. Jørgensen HS, Nakayama H, Raaschou HO, Vive-Larsen J, Støier M, Olsen TS. Outcome and time course of recovery in stroke. Part II: time course of recovery the Copenhagen Stroke Study Arch Phys Med Rehabi. (1995) 76:406–12. 34. Nouillot P, Bouisset S, Do MC. Do fast voluntary movements necessitate anticipatory postural adjustments even if equilibrium is unstable? Neurosci Lett. (1992) 147:1–4. 37. Pélissier J, Pérennou D, Laassel E. Analyse instrumentale de la marche de l’hémiplégique adulte: revue de la littérature. Ann Réadap Méd Phys. (1997) 40:297–313. Copyright © 2019 Delafontaine, Vialleron, Hussein, Yiou, Honeine and Colnaghi. This is an open-access article distributed under the terms of the Creative Commons Attribution License (CC BY). The use, distribution or reproduction in other forums is permitted, provided the original author(s) and the copyright owner(s) are credited and that the original publication in this journal is cited, in accordance with accepted academic practice. No use, distribution or reproduction is permitted which does not comply with these terms.